Börft has always been a really big label for me. I come from that era when people made mix tapes, they never put the names of the songs down. You'd go to a soundsystem and the DJs would put stickers over the labels. Jah Shaka was always really secretive. I liked that. This Frak song has been in my box since it came out in 2012 – it's just been reissued, but before that no one really knew what this was. The label has been going for twenty-something years. Frak are like the in-house band. They're from the middle of nowhere in Sweden. One of them's a postman. 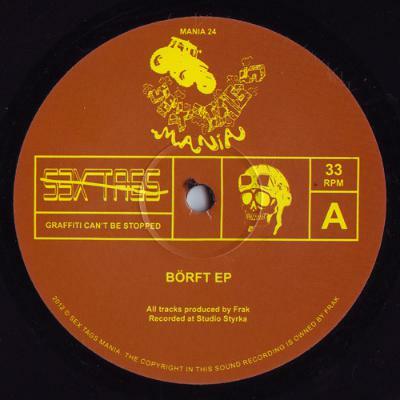 The Börft catalogue is huge, it's a great label – it's similar to L.I.E.S. in a way. 'Synthfrilla' is a big track of theirs. It used to go for about £100. Weatherall has been talking about it a lot lately. It was a benchmark track for me when I did 'Gamma Ray' – mine is a poor man's imitation.